A New Ramp for the Pierce County Medical Reserve Corps – Specialty Products, Inc. The Pierce County Medical Reserve Corps, (MRC) organized through the Tacoma-Pierce County Health Department exists to promote partnership among community health systems, community medical providers, other community groups and the Health Department. Their mission is to train and coordinate dedicated volunteers to improve the health, safety, preparedness, and emergency response capabilities in Pierce County. 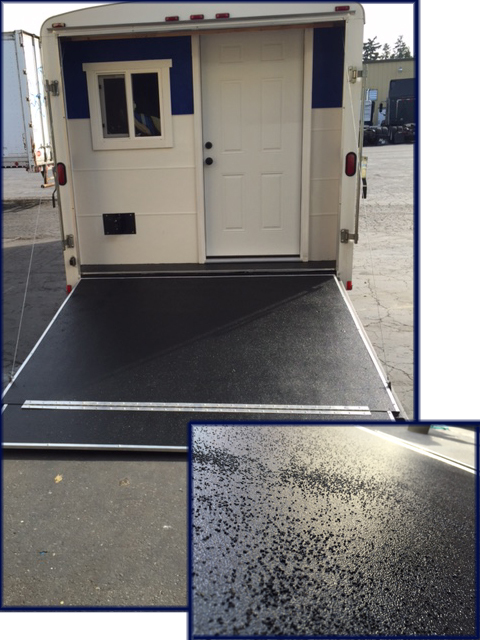 The Pierce County Reserve Medical Corps trailer with plain wood ramp, before SPI’s traction-ready polyurea application. 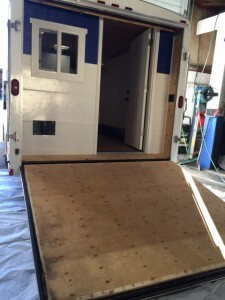 A trailer that will be used as a mobile medical clinic during major disaster emergency responses, and to reach the transient community in Pierce County, Washington, had a wooden ramp that needed to be protected against abrasion, and for safety reasons, needed a non-slip surface. 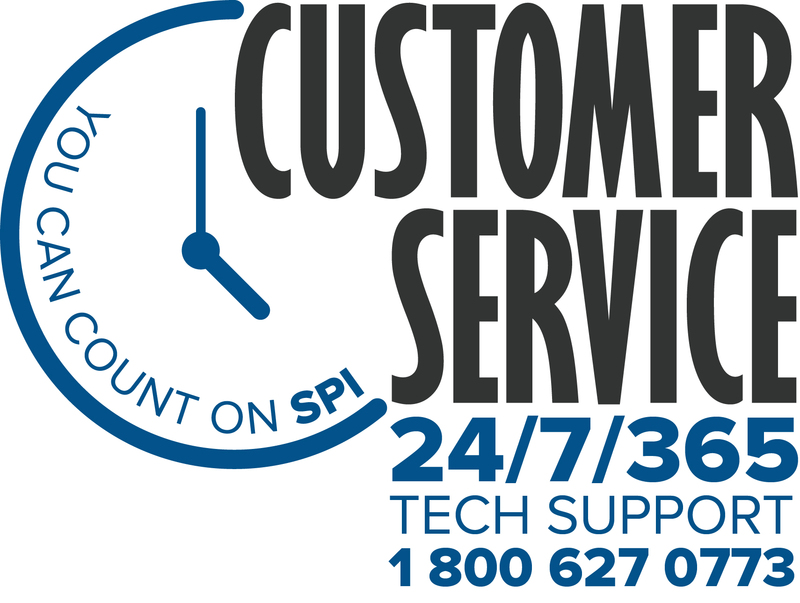 Mark Moser of MRC, was vaguely familiar with polyurea coatings, and aware of SPI’s outstanding corporate responsibility and willingness to help support local organizations, he reached to SPI for a resolution. 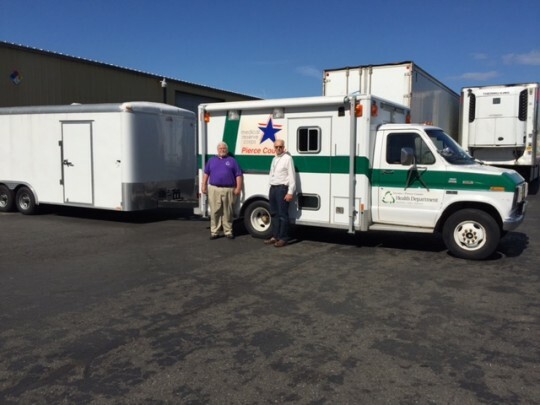 Moser delivered the trailer to SPI’s team in Lakewood who were up to the task. 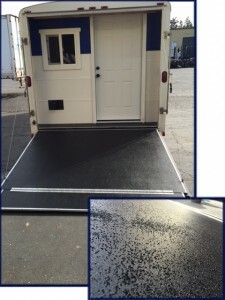 The mobile medical clinic trailers’ wood ramp was prepped, primed and sprayed with SPI’s highly abrasion resistant bed liner polyurea; black FMJ Plus. Aluminum oxide was then broadcast in the FMJ Plus coating to create a non-slip surface on the ramp. A thin layer of SPI’s polymeric topcoat, black PTC was applied over the aluminum oxide to help keep the aggregate encased in the basecoat, and to increase color retention of the coating due to the constant UV exposure the ramp would experience once in the field of operation. Moser, and Jim Price of the Tacoma-Pierce County Health Department seen in the photo were delighted with the outcome of the ramp. 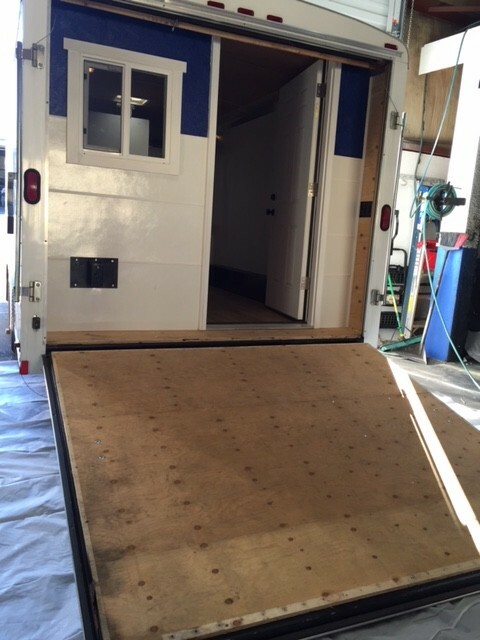 The trailer is now ready for any emergency that may come their way.